I’ll try to keep this post somewhat short — it’s been a busy day and the triplets and I are tired! 🙂 Nonetheless, I wanted to update you on some exciting news we received at my appointment today. EACH OF THE TRIPLETS IS 3 LBS. OR MORE!!! My mom and I were stunned when the ultrasound tech. told us. Three pounds? There are quite a few singleton babies who don’t come out that heavy. Our girls seem to be on the right track for a healthy delivery. One of the babies was even “breathing” when we saw her on the screen. (Since there’s no air to breathe, she was really just moving her diaphragm, as if she were breathing. That’s an excellent sign of lung development!) Fluids and heart beats are still good. Hopefully it’s not too early to say this, but we seem to have bypassed the triplet-to-triplet transfusion risk. They keep telling me that eventually, the babies’ weights will plateau, but as long as they’re all proportional and similar in size, we should be good. We picked out some paint for the triplets’ room. I figured “three colors for three babies.” I’ve been a little “pinked out” from Hannah’s wardrobe and bedroom lately, so we decided to go “subtle feminine” with dark purple, yellow, and light gray. We start painting tomorrow — I’ll be sure to share a picture when it’s done. Normally, I wouldn’t go through the trouble of painting a room when there’s so much to think about in a pregnancy like this, but the room we put them in is blue, and I just couldn’t bear the thought of bringing my three little GIRLS home to a boy’s room. 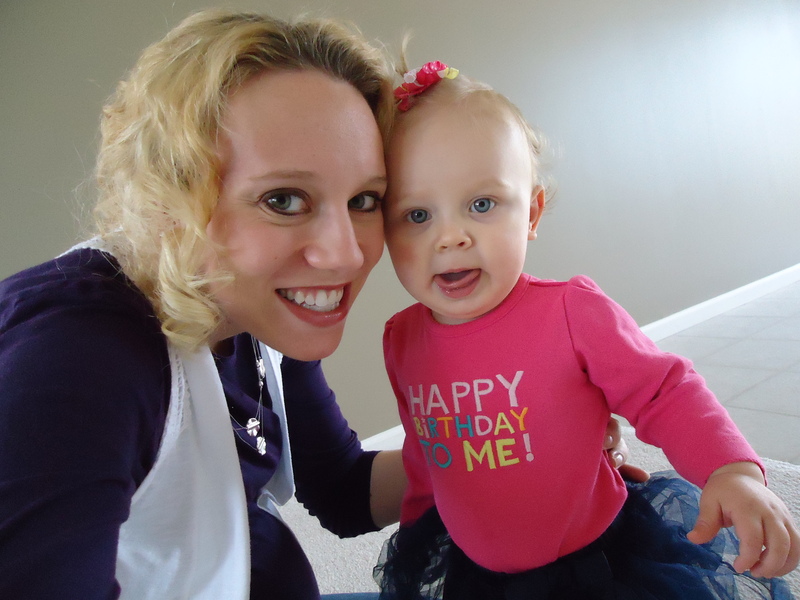 We had Hannah’s first birthday party this past weekend. It was a lot of fun. My grandparents even came all the way from Haubstadt, IN to join us. Hannah got some great gifts like a winter coat, a Disney princesses “play hut,” an educational talking dog doll, jammies, and a birthday charm from mommy and daddy for her charm bracelet. I also received a few gifts — three to be exact. 🙂 My grandma made little matching white bonnets for the girls’ baptism. They are so special. The cake smash was pretty fun — I had no doubts that Hannah would dive right in and she did. 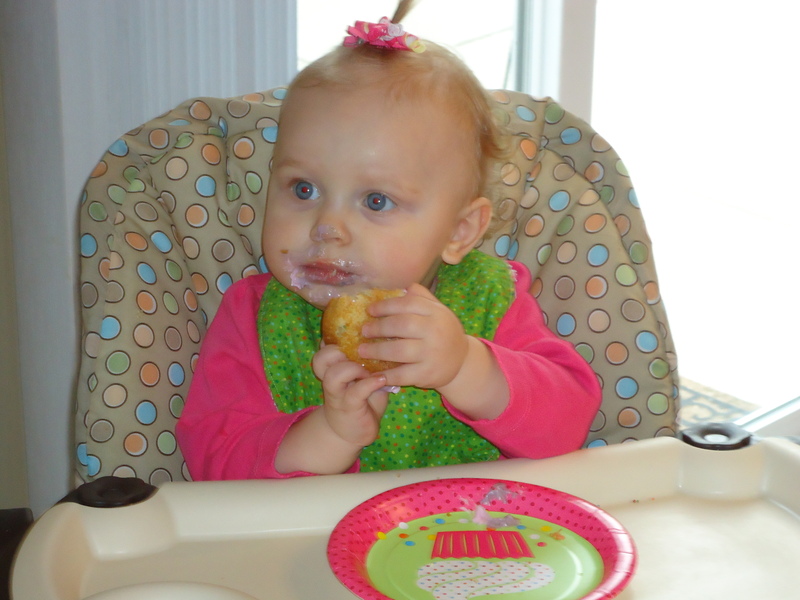 I think the weekend put her on quite a sugar high though — she was a little cranky the next day. 😦 We actually had Hannah’s 12-month appointment today with our new pediatrician here in Greenwood. I highly recommend Pediatric Associates of Greenwood if you’re looking for a doctor on the southside!! They have a beautiful and inviting office with doctors who have an excellent bedside manor. Unfortunately, Hannah had to get FIVE shots today. 😦 Needless to say, she wasn’t a happy camper, but she took it like a champ. Feeling: Everything!! These babies are quite active. Outlook: A little nervous — the big day is getting close! Woo hooo…on your way to 30 Weeks. Way to go MAMA! I sent some stuff your way. Please let me know what else you need and I will see what I can rummage up. Praying for you and the girls to hit 35 weeks. I have a very good feeling about it and I would not be surprised if you end up with 3, 5 pounders. I have thought that from day one. Don’t ask me how…I just know it! You look great!! So glad you all are still doing well and settling in at your new home. We miss you up here at SMS. Prayers for 35 weeks!!! his care and attention to ALL of his girls! !